Calcium and magnesium are two macrominerals that are biologically intertwined at the cellular level — a sort of biological yin and yang, if you will. These minerals work together to promote optimal cell metabolism, and keeping them in balance helps ensure that you stay healthy. Both calcium and magnesium are considered macrominerals because the body needs more than 100 mg of each per day. While you can get these minerals from food, taking a calcium-magnesium supplement may help in certain circumstances. You likely know that calcium is important for healthy bones, but this mineral does a lot more. As the most abundant mineral in the human body, calcium enables cells to communicate with one another, helps build muscle tissue, and supports the production and secretion of the hormones used in growth and reproduction. Low levels of calcium can cause weak bones, brittle nails, weakened grip strength, and fatigue. Calcium deficiency is usually caused by a medical issue, rather than a dietary lack. Magnesium may not be as well-known as calcium, but this fellow mineral is also vital to your health and well-being. Magnesium is used in more than 300 enzymes, and it helps your body make DNA, RNA, and the antioxidant glutathione. It builds proteins for muscle, bone, and nerve cells, and helps the immune system. In addition, magnesium helps your body absorb calcium. Hypomagnesemia, or magnesium deficiency, is usually diet-related, but can also be caused by alcohol abuse or certain kidney conditions. A deficiency in magnesium can cause mental health issues such as anxiety and depression, or physical symptoms like leg cramps, constipation, and heart palpitations. Low magnesium is a stronger predictor of heart conditions than high cholesterol and saturated fats, yet 48 percent of Americans do not get the recommended daily allowance. This preventable deficiency — and the consequences — are so serious that one group of scientists called it "a public health crisis." 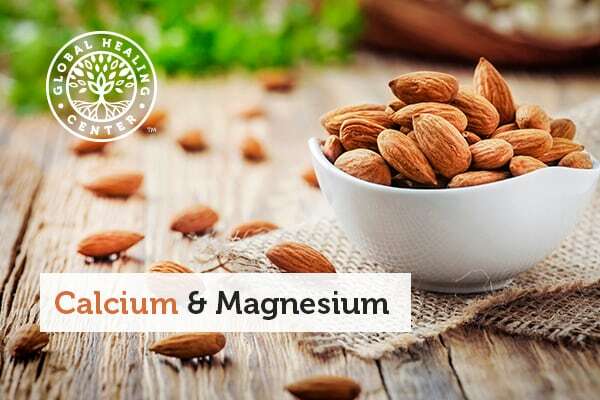 How Do Magnesium & Calcium Work Together? Magnesium and calcium are both electrolytes that carry two positive electrical charges (Ca++ and Mg++); in other words, they are cations, which means positively charged ions. Processes in the body constantly work to keep the extracellular levels of these minerals — the amount outside of cells, and in the blood — in balance. Magnesium and calcium ions can flow by diffusion through cell channels, but when they are bound to other compounds like orotate or citrate, they may need to be actively transported via a "protein transporter molecule." Both get absorbed in the gastrointestinal (GI) tract and distributed throughout the body and its organs through the blood. How Does Magnesium Affect Your Calcium Level? Magnesium is needed for the body to properly absorb calcium, and studies show it even helps dissolve calcium in the blood, deterring the formation of kidney stones. When people are deficient in magnesium, it leads to "secondary hypocalcemia" — or calcium deficiency. Thus, calcium and magnesium play an interdependent role in the body. 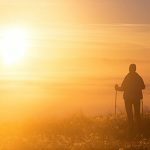 Some patients with both magnesium and calcium deficiency further develop resistance to vitamin D absorption, a nutrient that helps the body absorb these macrominerals. You can see why taking enough of all of these minerals and nutrients is critical for having strong bones, a healthy heart, and a properly functioning nervous system. While calcium and magnesium work together in many body processes, they sometimes have opposing effects. For example, calcium contracts muscle cells, while magnesium relaxes them. In certain situations, these minerals may actually compete with one another. Usually this happens when the blood has too much calcium and not enough magnesium. As a result, it's important that you take these minerals in the correct ratio to prevent an imbalance. What Is the Recommended Ca:Mg Ratio? Most experts recommend a 2:1 calcium to magnesium ratio. In other words, if you take the recommended daily allowance (RDA) of 1,000 mg per day of calcium, you should take 500 mg per day of magnesium. Studies show that it is best to not consume more than 500 mg of calcium at a time, so split up your dose, or consume calcium in foods, which naturally spreads it out it up throughout the day. Most people in the United States and the Western world get ample calcium — perhaps even too much given calcium's prevalence in fortified foods. However, without enough magnesium, our bodies are unable to fully use the calcium we do consume. If you are consuming too much calcium or you are not getting enough magnesium, you might want to adjust your calcium to magnesium ratio closer to 1:1 by increasing your magnesium intake, ensuring that you do not exceed 1,000 mg per day of calcium. Below are the Recommended Dietary Allowances (RDA) set by the Food and Nutrition Board of the Institute of Medicine. Your specific needs may vary, so contact your healthcare professional for advice. Adequate Intake means this amount is enough to ensure nutritional adequacy for young babies, but they may need more. The proper ratio of magnesium and calcium helps your health in a variety of ways. Below are the top benefits that magnesium and calcium provide. Because of their positive electrical charges, the body uses calcium and magnesium - as well as sodium, potassium, and other ions — to send electrical impulses through nerve cells (neurons), which is how the body transmits messages from the brain to the body. It's truly an amazing process: cell channels open or close, regulating the electrical charge on one side of a cell membrane, which sends messages throughout the body. These are our thoughts, and the electrical impulses are the synchronous communication that connects mind and body. Changes in calcium levels in the blood can have substantial changes on nerve cell function. Calcium builds strong, dense bones and teeth. Magnesium is also important to bone health. Maintaining adequate levels of calcium and magnesium prevents the low bone density that often comes with age — or when advanced, osteoporosis, which literally means "porous bones." Since magnesium is needed for calcium absorption into your cells, including bone cells, it's critical to take both of these minerals. Low calcium and low magnesium levels may influence your quality of sleep. With an adequate supply of each, the body can properly regulate hormones that promote a full night's rest, such as melatonin and cortisol. When calcium levels are too high and magnesium too low, the body produces excess cortisol, sometimes called the stress hormone. Cortisol can interfere with sleep. Calcium and magnesium work together to help muscles contract and relax. Calcium helps with the contraction, while magnesium works to relax them. When there is too much calcium, or too little magnesium, in the blood, muscle tension increases, which may lead to spasms, twitches, and feelings of restlessness. Getting proper levels of calcium and magnesium ensures your muscles stay strong and function correctly. A thriving gut microbiome not only improves digestion but also is linked to mental wellness and overall health. Deficiencies in calcium and magnesium reduce the diversity of your gut microbiota, and this lack of microbial diversity, coupled with calcium buildup in the gut, can lead to constipation and other gastrointestinal issues. Magnesium (such as in Epsom salts) is even used as a laxative in some cases, relaxing the muscles of your lower colon and reducing constipation. To ensure you have a healthy gut and healthy body, taking adequate amounts will help improve the diversity of your gut microbes and keep your bowels moving smoothly. A growing body of evidence suggests that excellent nutrition affects the health, well-being and the attractiveness of the skin. Calcium and magnesium are two such minerals that promote skin health. Some studies suggest magnesium applied to your skin directly (topically) may improve skin smoothness and hydration while reducing redness and swelling. This dynamic duo of macrominerals also promotes heart health. Calcium and magnesium work together to maintain the healthy muscles and blood vessels required for the heart to function at its best. Low magnesium can lead to a buildup of calcium in the blood, which can calcify the arteries and other blood vessels. The Atherosclerosis Risk in Communities (ARIC) Study found that people with low magnesium and high calcium had a greater risk of hypertension (high blood pressure), stroke, and heart conditions. Presumably, the opposite holds as well: ensuring an adequate balance of these minerals supports heart health. Calcium and magnesium support joint health. When magnesium levels fall too low, calcium can build up in the joints. Over time, studies indicate that not getting enough magnesium can lead to osteoarthritis, a degenerative joint condition, rheumatoid arthritis, and joint space narrowing, particularly in Asian and Caucasian but not African-American populations studied. Magnesium intake also supports healthy cartilage. Additionally, you can find calcium in foods such as yogurt, milk, oranges, and dates. Magnesium is readily available in beans and even dark chocolate. A diverse diet can help you consume an optimal amount of both these vital nutrients. It's best to get your calcium and magnesium from a balanced diet because the body absorbs them best from foods. Where your diet falls short, you can get these essential minerals from supplements. Calcium and magnesium supplements come in a variety of forms, including tablets, liquids, and powder. The best form of magnesium and also calcium are orotates; in other words, calcium orotate and magnesium orotate. Dr. Hans Nieper found that orotates are preferentially transported across the cell membrane, allowing for up to 95 percent absorption, compared to a mere 30 percent for citrate and even lower for carbonates. Many nutrients rely on each other and work in tandem to be absorbed and effectively used by your body – calcium is no different. Vitamin D helps your body get the most out of the calcium you consume in your diet. This is important because if you're unable to use the calcium you receive from food, your body may pull it from your bones. Although you need both calcium and magnesium, you do not necessarily have to take them in the same tablet. However, doing so minimizes the number of tablets you have to swallow and may save on costs. You can take either mineral at any time of the day, with some caveats. Calcium should not be taken in doses higher than 500 mg elemental calcium — the absorbable calcium from a supplement which all supplements must report— at a given time. Most supplements provide much less than this. One type of calcium supplement, calcium carbonate, must be taken with meals because it requires stomach acid to liberate the calcium from the carbonate, whereas others like calcium citrate and calcium orotate can be taken without food. When you take magnesium before bed, it can help your body relax and encourage restful sleep. At very high concentrations, calcium can interfere with magnesium and vice versa, the dosages on most supplements are moderate and, under the RDA, so you can safely take them together. Our bodies evolved to absorb multiple minerals and vitamins from our food, digest them, and deliver the absorbed portion to the cells and tissues that need it. However, if you have a specific health condition, contact your healthcare provider. 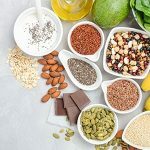 Most people can get sufficient levels of calcium by eating a balanced diet, but it can be harder to get enough magnesium — hence the widespread level of magnesium insufficiency and deficiency in people. The key is finding the right balance between the two minerals and making sure you also get sufficient levels of other key nutrients, like zinc, vitamin D3, selenium, phosphorus, potassium, and methylsulfonylmethane (MSM). Each one of these plays a vital role in maintaining your health and well-being. The Food and Nutrition Board established the tolerable upper limits for calcium listed below, but please be aware that these levels are not necessarily what is recommended or best for your health, given the scientific research linking excess calcium supplementation to cardiovascular conditions. To avoid calcium toxicity that would come from excessive amounts in the blood, pay careful attention to your daily intake. Remember that there are many calcium-fortified foods on the market, from orange juice to bread. Too much calcium can not only interfere with magnesium absorption, but can also lead to cumbersome side effects including constipation, kidney stones, fatigue, and headache. The best calcium supplements include magnesium, which maximizes your absorption of the former, while also giving you the benefits of the latter. Supplements with calcium orotate and magnesium orotate are ideal because orotates can cross the cell membrane and enter the cell for maximum bioavailability. Look for products that are plant-sourced, GMO-free, and free of impurities. Intracal™ is one such product with a perfect ratio of calcium to magnesium. Calcium and magnesium are two macrominerals that are vital to overall health and well-being, so make sure you get enough. The ideal ratio of calcium to magnesium is usually 2:1 but can vary depending on a number of factors, including your age and your current health status. Almost half of Americans are magnesium-deficient, which means many people may need a 1:1 ratio, which essentially means more magnesium. Whether you are getting these minerals through diet or supplementation, maintaining balanced levels of calcium and magnesium will promote optimal brain, bone, muscle, and heart health. "Calcium: Fact Sheet for Health Professionals." National Institutes of Health Office of Dietary Supplements. Published 2 March 2017. Accessed 13 Aug. 2018. "Magnesium: Fact Sheet for Health Professionals." National Institutes of Health Office of Dietary Supplements. Published 2 March 2018. Accessed 13 Aug. 2018. De Baaij JHF, et al. "Magnesium in Man: Implications for Health and Disease." Physiological Reviews. 2015; 95(1),1-46. Rosanoff A, et al. 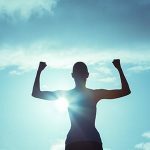 "Suboptimal magnesium status in the United States: are the health consequences underestimated?" Nutr Rev. 2012, 70(3),153-64. DiNicolantonio JJ, et al. "Subclinical magnesium deficiency: a principal driver of cardiovascular disease and a public health crisis." Open Heart. 2018, 5(1),e000668. Riley JM. "Effect of Magnesium on Calcium and Oxalate Ion Binding." J Endourol. 2013;27(12),1487–1492. Paunier L. "Effect of Magnesium on Phosphorus and Calcium Metabolism." Monatsschrift Kinderheilkunde. 1992; 140(9), S17-20. Simons TB. "Calcium and neuronal function." Neurosurg Rev. 1988,11(2),119–129. Castiglioni S, et al. "Magnesium and Osteoporosis: Current State of Knowledge and Future Research Directions." Nutrients. 2013;5(8),3022-33. Boyle NB, et al. "The effects of magnesium supplementation on subjective anxiety and stress—A systematic review." Nutrients. 2017;9(5),429. Abbasi B et al. The effect of magnesium supplementation on primary insomnia in the elderly: A double-blind placebo-controlled clinical trial." J Res Med Sci. 2012;17(12),1161-9. Asker, S., et al. "Serum levels of trace minerals and heavy metals in severe obstructive sleep apnea patients: correlates and clinical implications." Sleep Breath. 2015;19(2),547-52. Gold ME, et al. "Antagonistic modulatory roles of magnesium and calcium on release of endothelium-derived relaxing factor and smooth muscle tone." Circ Res. 1990;66(2),355-66. Deans E. "Microbiome and mental health in the modern environment." J Physiol Anthropol. 2017;36,1. Crowley, EK., et al. "Dietary Supplementation with a Magnesium-Rich Marine Mineral Blend Enhances the Diversity of Gastrointestinal Microbiota." Marine Drugs. 2016;16(6),pii: E216. Proksch E, et al. "Bathing in a magnesium-rich Dead Sea salt solution improves skin barrier function, enhances skin hydration, and reduces inflammation in atopic dry skin." International Journal of Dermatology. 2005;44(2),151-7. Lutsey PL, "Serum magnesium, phosphorus, and calcium are associated with risk of incident heart failure: The Atherosclerosis Risk in Communities (ARIC) Study." American Journal of Clinical Nutrition. 2014, 100(3), 756-64. Zeng C et al. “Association between dietary magnesium intake and radiographic knee osteoarthritis." 2015, 10(5), e0127666. Nieper HA. "Recalcification of bone metastases by calcium diorotate." Agressologie. 1970;11(6),495-502. Available as article #CA21 from the A Keith Brewer International Science Library. "Calcium and Heart Disease: What is the Connection?" Harvard Heart Letter. Published January 2017. Accessed 6 Sep. 2018.